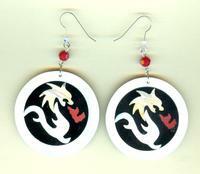 Unleash your wild side with a pair of elegant yet rocker fire breathing dragon earrings. 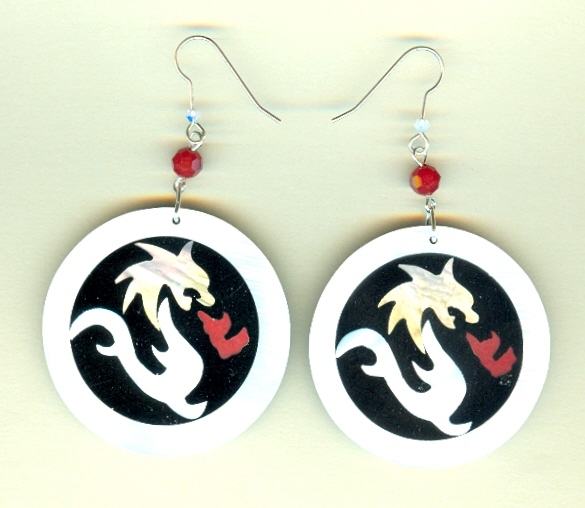 These earrings are lightweight and made of laminated shell with sparkles of flame red and iridescent Swarovski Crystals. The French hooks are sterling silver and each earring?s diameter is 45mm. It dangles about 3-1/8 inches from the top of its earring hook. These earrings are very versatile and can be worn with a casual or dressy wardrobe. So be as good or as bad as you want to be ? these earrings have got your back. When versatile beauty is what you crave, look no farther than SPARKLE PLENTY. Tiny black, white, and bronze beads make up this dramatic pendant.